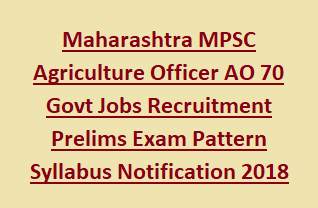 MPSC Agriculture Officer Jobs AO Prelims Exam 2018: Maharashtra Public Service Commission invites online from the Agriculture or Horticulture B.Sc/B.Tech Degree qualified candidates for the MPSC Agriculture Officer jobs in Maharashtra Agriculture Service. There are total 70 AO Agriculture Officer jobs and Agriculture Director jobs in this MPSC Agriculture Officer Recruitment Prelims Exam 2018 Notification. Closing date for online application for this MPSC Agriculture Officer Jobs AO Prelims Exam is 07-08-2018. Online application link is activated on 25-07-2018 for this MPSC Agriculture Officers jobs Exam. The selection for MPSC Agriculture Officer Vacancy Recruitment 2018 will be through Prelims Exam, Mains Exam and Interview. Prelims exam is already completed this notification is for MPSC Agriculture Officer Mains Examination. If you have sufficient educational qualifications then submit your application online through MPSC recruitment portal of http://mahampsc.mahaonline.gov.in. Applications for this MPSC Agriculture Officer AO jobs will be accepted through online mode only. For brief details of MPSC Agriculture Officer Jobs AO Recruitment of MPSC Agriculture Service Prelims Exam Notification 2018 exam pattern and syllabus, qualification, age limits and more info is given below. There are total 70 Agriculture Officer AO vacancies available in Maharashtra Agricultural Service. Candidate should have qualified B.Sc Degree or B. Tech Degree in Agriculture in Horticulture from a recognized Agriculture University or Approved universities. As on 01-07-2018 age limits For Unreserved candidates is 18 to 38 years and for all reserved candidates 5 years of upper age relaxation is given. Selection for this Maharashtra Agriculture Officer Jobs recruitment 2017 will be through Maharashtra Agriculture Service Prelims Exam, Maharashtra Agriculture Service Mains Exam and Personal Interview. MPSC Agriculture Service Prelims Exam will be objective type only. Total 100 questions will be given and for each question 2 marks will be given. Exam duration is one hour. Exam Pattern and syllabus for Maharashtra Agriculture Service Prelims exam is given below. Mains Exam will be conducted for 400 marks. Mains Exam consists of 2 different papers. Necessary qualifications having candidates can apply online through MPSC recruitment website of mahampsc.mahaonline.gov.in. Closing date for submission of application form online is 07-08-2018. After submission of application form online download the Agriculture officer exam syllabus and start preparation. At the time of online application don’t give any fake contact details. Provide currently using mobile number and mail id. Click here to apply online for the MAHARASHTRA MPSC Agriculture Officer Jobs Recruitment Prelims Exam 2018. Click here to see the official notification of Maharashtra AO Agriculture Officer Jobs Recruitment Prelims Exam. Please share this Maharasthra MPSC Agriculture Officer Recruitment 2018 article to your lovable friends through online via social web.